Following a pickup from your Paris hotel, travel by air-conditioned minivan to the Musée d’Orsay, by the Seine River in central Paris. 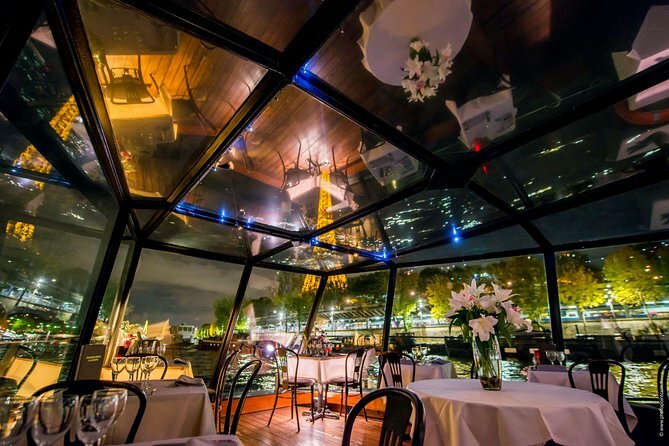 Here, hop aboard your La Marina de Paris boat, a glass-enclosed vessel boasting amazing views along the river from every seat. — Notre Dame Cathedral, the Louvre Museum, the National Assembly and the Pont Neuf. Illuminated against the darkness of night, these sites take on an utterly enchanting beauty. Lovely way to spend the evening, wonderful food, seeing some of the historical buildings of Paris from the water and a bit of dance near the end of the trip. We also got to see the beautiful light show of the Eiffel Tower from the vantage point of the Seine. The driver Camacho that picked up us up was awesome. The cruise was great. The dinner ok not bad but really not as good as I thought it would be. What a great 1st night in Paris. Lovely dinner, great views... A fantastic evening!!! Was a lovely experience and wonderful views. The experience was good but the food was average. Pick up at the hotel was on time. Dinner was good, but tables were crowded together. Up charge for the steak was not noted by the waiter and we missed it on the menu. Disappointing considering the price for the package was on the high side already. Cruise was excellent with stop at Eiffel Tower at 11:00 pm for light show. the trip on the Seine was very disappointing . We were lucky to have taken our vouchers from Viatour showing that we we had paid for the dinner and half bottle of wine per guest. as the staff were insisting that we should pay for the wine , we also thought that coffee would be included ,it wasnt, we also thought we would have a choice of dishes on the menu, but it was a set menu. made us feel very unwelcome . there was no commentary on the cruise and very little atmosphere. The whole experience was very mediocre, and would not recomend this trip to other travellers. On a brighter side we were picked up and returned to our hotel by a very courteous driver. We had to change last minute our hotel and have decided to walk to the given address where the boat was supposed to be and this more then 1 hour in advance at the address Port Solferino 23 where the boat Marina de Paris was supposed to be for check-in. At the spot there was no boat and no people, we did ask several locals and they all send us back to the above address. after a while we contacted Viator help desk and they tried to help us but somehow it did not worked out and they could not find us ?! After being in the cold for hours we were sick of this and decided to move on, this whole disaster evening has destroyed our lovely plans we had and booked for 6 months in advance, so not a nice evening at all and a waste of money. Not even sure this company is for real at the moment.